It was a pleasure doing business with you and we will definitely be back again!! Thank you for a fun weekend! Very satisfied with the entire experience, from first making reservation to checking out. My husband and I had such a great time during our stay at the Beach Bijou. We are already planning our next stay. I took this opportunity to write a great review on my blog site. I caught some really nice shots of the location and property. Please use the link https://natashajbedford.com/2018/04/25/traveling-oregon-coast/ to see the photos and read the review. Please contact me at [email protected] if you would like to use the pictures or collaborate on future projects. Thanks again for an amazing time! Natasha J. Bedford Hi Natasha. We are thrilled that you enjoyed your stay at Beach Bijou! You will be hearing from our office regarding your stay. Your blog and photos are also of great interest. We are planning a photo contest this summer with the prize being a weekend stay at one of our homes. Thanks for the great review and we will be talking to you soon! 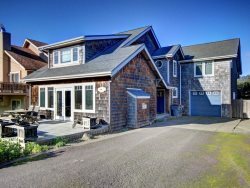 Cannon Beach Vacation Properties is a friendly, helpful, and responsive company to work with. The city of Cannon Beach is a great place to visit. Our vacation was so wonderful that we are going to return in June 2018. There is so much more to see and do! As to the company, I have nothing but praise. I found the staff to be welcoming and friendly, while being professional and efficient. We hated to leave and home to come back for a longer stay next fall. We will just have to see how moms health holds up! The team was professional, friendly, and helpful when answering any questions we had. Love the location, which overlooked the ocean and Haystack Rock. Cute little house, which met all of our needs. Wouldn't hesitate to come back.